All lawyers in California must be fingerprinted prior to April 30, 2019. 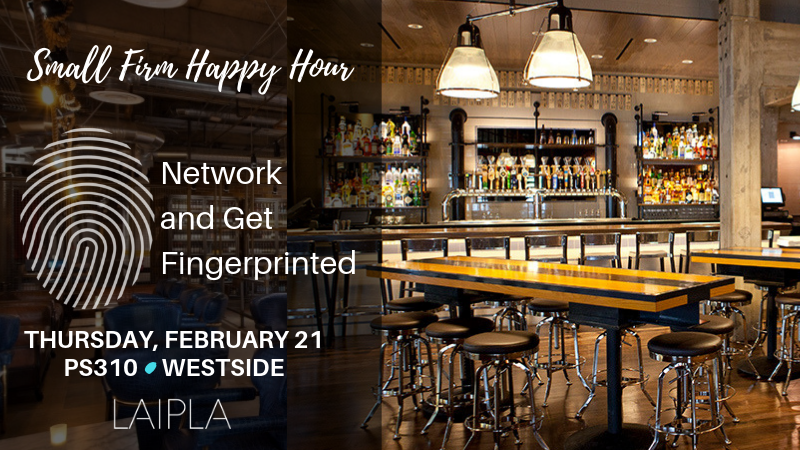 Come network with your fellow Solo and Small Firm LAIPLA members while taking care of your obligation to be fingerprinted. The Solo and Small Firm Outreach Committee of the LAIPLA is having a cash bar Happy Hour at Public School 310 in Culver City. We are also providing participants an opportunity to satisfy their obligation to be fingerprinted before the rapidly approaching April 30th deadline; a Live Scan vendor will be available to take and process your fingerprints as required under the new California Bar rules. Registration for the Happy Hour is free but required. Cost to take and process your fingerprints is $74 including required government fees. Payments for the fingerprints will be collected by Live Scan at the event. Not on the Westside? Another happy hour will be held at District Bar, in DTLA on Thursday, February 7, 2019. Sponsorship? See LAIPLA Sponsorship Opportunities 2019 for this event and others.